Iranian nationals were undoubtedly perplexed when a digital poster, containing these words superimposed on a photo of a smiling Israeli man holding his daughter, suddenly appeared on the Internet in March 2012. The creator of this provocative image, Israeli graphic designer Ronny Edry, discussed how his creation spawned a global revolution in social media—and what that revolution portends for the future of the Middle East—in a talk at International House on Tuesday. It all began as a casual experiment, Edry said: “just a message in a bottle” that he sent out into cyberspace on a whim. It soon resulted in the creation of a Facebook page, “Israel-Loves-Iran,” which attracted thousands of participants, millions of viewers, and the attention of the world press. The page allowed Israelis and Iranians to exchange digital posters modeled on Edry’s original and to express mutual goodwill and a desire for peaceful coexistence. Before long, similar posters began appearing from other nations, like Japan, Colombia, and the United States. The page has since evolved into an expansive online project known as the Peace Factory and the related Peace Innovation Lab at Stanford University. According to Edry, the Israeli-Iranian dialogue fostered by this project exposes the changing nature of public opinion throughout the Middle East. In spite of the aggressive posturing and warlike rhetoric of national leaders in the region, he believes that the vast majority of citizens in the area do not want war. As a graphic designer, Edry appreciates the power of perception. 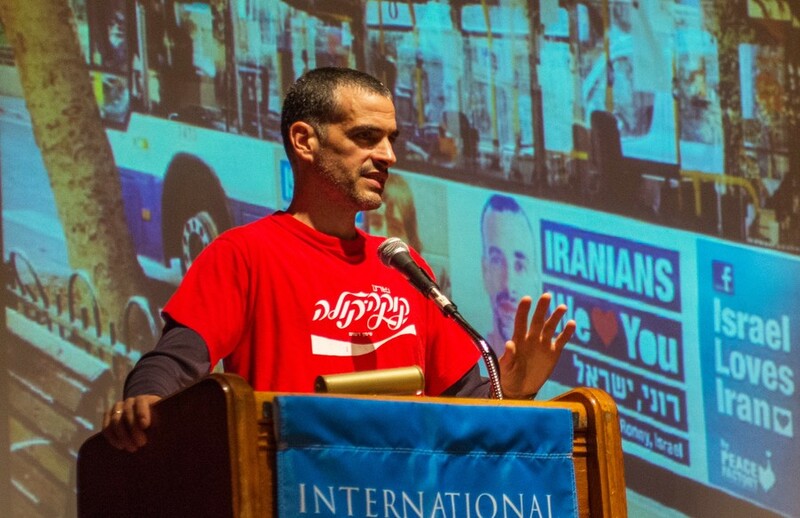 He seeks to use powerful imagery to “change perceptions” among Israel and its neighbors. “That’s really how you make change,” he said.